Mahnaz woke to the buzzing of the alarm clock. She leaned over, turned it off, and lay back. I must get up now, she thought, I will have to see Dr. Gibbons this morning. But she kept lying there, tired. No, more, reluctant to face the day. 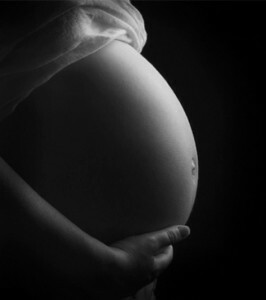 She wondered if it all had to do with her pregnancy, or her suspicion of being pregnant. It was wonderful of course to have Sharon. So much of the meaning of her days, her daily routine, revolved around Sharon– first a small, wrinkled thing, gurgling, fretting, clutching at her plastic animals or blocks, then changes coming over her, going from soft to hard food, teething, making exploratory sounds that only resembled words and then long phrases that seemed to come from inside of a wound-up doll. On some days she would take Sharon into her own bed for a while and hold her in her arms and tell her a story until she fell asleep and then she would put her back to her bed. When she had work to do around the house, Sharon sat nearby with a puzzle or her doll house and played. But now she was looking forward to Sharon becoming more self-sufficient so that she could go back to school and build a career for herself. Not that it was impossible with a new child. It was just harder, would postpone things. But that was not all there was to her ambivalence. It was this apprehension that the world the three of them had built together was somehow fragile, that a sharp enough blow would destroy it. They had reached a balance finally, it seemed to her, that rested upon tensions and disagreements smoothed out over the years, problems anticipated and avoided when possible. They used to argue over such things as: what kind of wedding they would have– they ended up getting married by a justice of the peace, avoiding both parents’ pressures, his wanting a Christian marriage, hers a Muslim one. When she became pregnant for the first time they talked for hours about what kind of name to give the baby, American or Iranian. Sharon had been a compromise; an Iranian name, Shirin, was very similar to it. Then there were problems she had managed to finally be at peace with as she realized the solutions were out of her reach. She had been full of guilt for not having her family participate in her wedding or when she gave birth. Visa problems for them to come to the US made it impossible and there was a risk for her and Paul to go to Iran due to all the tensions between their countries. Then there were some differences between her and Paul rooted in having been raised in two different cultures. She couldn’t laugh at American jokes, couldn’t connect to Western movies he devoured. He couldn’t understand why she would not develop a taste for drinking with meals, even a glass of wine, why she disapproved of people laughing loudly or dressing in ways that exposed too much of their bodies. Reflecting on all that, she was amazed that she was still embedded in her upbringing, considering how hard she had tried to get away from home. The house she grew up in, with its walled-in courtyard, windowless rooms, the gray streets in Ghanat Abad, with some of the houses and shops boarded up, damaged during the Iran-Iraq war and never repaired, women forced to wear dark shroud-like chadors, had been like jail. When she just came to the US, she had nightmares about being forced to go back there. In one nightmare she was walking on a street near their house in Tehran. A grotesque looking beggar leaped out of a doorway and held out his hand to her, asking for money. As she reached over to give him a coin, the man suddenly grabbed her hand and tried to drag her into the dark hallway of the house. She began to scream and he finally let go. She stared at the embroidered tapestry, on the wall across from the bed, sewn by her grandmother. It depicted birds and flowers around a circle. The birds seemed pulled against their will toward the center. She remembered how as a child she used to look at that tapestry, that hung on a wall in her room then, and imagined fearfully that the birds would exhaust the energy of their wings and be swallowed by some mysterious gravity. She had a similar feeling now– that the balance in her life could at any moment be destroyed by something beyond her control. She got out of the bed and went into Sharon’s room. She was asleep. Paul had left the night before for a business trip– consulting for a school using behavioral techniques with autistic children. She went to the bathroom and turned on the shower. From her reflection in the mirror, she could see no signs of pregnancy yet. Her skin had a healthy glow, her waist and thighs were slender. Only maybe her breasts seemed a bit enlarged. Perhaps she wasn’t pregnant. She still needed the test result from the doctor. After the shower and breakfast with Sharon, she took her to her nursery school, only two blocks away and then came back and drove to the doctor’s office in Port Jefferson with the roof of her Volkswagen open. She still got a thrill driving her own car. When she was a teenager she had seen her first American movie in a theater in north Tehran, a wealthy neighborhood; in the movie the young actress drove her convertible everywhere. It had struck her as so exhilarating. She passed houses with vast lawns, the fabric shop where she occasionally went to buy material to sew something for Sharon, when she had some free time. She had worked as a paralegal but when she became pregnant with Sharon she quit. She planned to go to law school in the fall. But if she was pregnant, she might have to postpone that. She passed the handicraft shop where she had recently bought a set of cranberry colored crystal glasses. She thought she would stop there later to see if they had a pitcher matching the glasses. The glasses’s color reminded her so much of the ones her grandmother had and used for serving cherry juice. The dogwoods lining the streets were all in bloom, their white blossoms creating the impression of snow and an aura of peace. She was aware though of a confused, insecure feeling inside her. She thought of when she just met Paul in North Carolina, where they had both been students at Duke University, and how being with him used to make her feel secure and precarious at once. He was stocky and blue-eyed, she thin with long dark hair that came practically to her waist and dark eyes. After the class in history ended, she asked him some questions about the lecture. He had answered with a touch of amusement; most of what she asked was common knowledge. They had continued talking while eating together in the school cafeteria. He asked her out and they started seeing each other regularly and were married within the year. It was the fact that she didn’t completely understand him, that he was a bit mysterious that had attracted her to him. But she was never been able to assess what qualities in her he had been drawn to. Perhaps that was the core of her feeling of insecurity and even a bit of fear of him. Meeting his parents at his home in Charlottesville had been uncomfortable. His father talked constantly and told jokes most of which she didn’t understand, his mother was stiff and had a perpetually critical expression on her face and asked her strange questions, like “Do they have houses in Iran or do most people live in tents?” Then at one time, when for a short period it became possible for her parents to obtain visas, the visit had gone badly. Her parents had treated him as if he were a creature from space. The remark stirred up Mahnaz. She wasn’t sure what Paul’s reaction to the pregnancy would be; she hadn’t told him she was pregnant, because of that uncertainty. Perhaps Paul too would be afraid of the consequences of another child, its effect on their relationship. She kept moving around in her seat. She picked up a magazine and put it down again. She had a sudden, terrible memory of a poor woman living next to their house on Khaki Alley. She had overheard her telling her mother, through tears, that she had given up her baby for adoption because she and her husband could not afford to have another child. Then she overheard another neighbor telling her mother that the woman had not really put up the infant for adoption but put her, wrapped in a blanket, on the doorsteps of a mosque, hoping someone would take her. For days and months she had been haunted by that and other stories of misery that spread in the alley. Life had been wretched for so many people, full of diseases, poverty, ignorance. And then all the losses they had suffered during the war lingered. There was such a gloom in the air at times, thick as smoke. Her own parents were well off enough since her father had a reasonably successful rug business in the bazaar but they lamented being held back from their real goals. He had wanted to be a doctor but after his father was killed by a missile during the war he had to support his two young sisters until they got married. Her mother had lost her job as a school principal during the Islamic Revolution– the school was shut down for not sufficiently following Islamic rules. Then she could not find another job. To avoid her parents’ constant complaints and bitterness Mahnaz used to spend most of her time in her room. As a result she did very well in high school and got a scholarship to an American university. Her father had said, “Go, go away and do something with yourself.” Getting the scholarship and being able to leave for a university in America was such an incredible experience, giving her the feeling that she could achieve anything she wanted. “Your turn Mrs. Dawson, will you come in…” The nurse, a pretty, young woman with red hair, was calling to her. She got up and went inside. The nurse told her to leave a urine sample in the bathroom and then go into the examining room and put on the robe hanging on the hook. Mahnaz did all that and then the nurse came in. She weighed her, and as Mahnaz lay on the examining table, took her pulse, her blood pressure. The nurse wrote them down on her chart. In a moment the doctor came in and the nurse left. He looked weary, his gray eyes were blood-shot, his hair tousled, but still he exuded competence. He looked at her file and said, “You’ve missed two periods… tenderness of… ” He sounded oddly off-hand, even indifferent. She remembered when she had just come to the United States, she had that feeling about most people, that they were friendly in a general way, impersonal. It took getting used to. So often she had felt, I don’t want to be back home but then my life here feels so transient. A little later she sat on a chair across from him in his office. “It seems like you’re in your third month,” he said abruptly. I ought to tell him what I am going through but what for? He with his cold eyes. On the way home she stopped to buy fruit and vegetables. The touch of the surface of the fruit did not bring its usual pleasure, neither did the sunlight brushing against her skin, she was so engaged with her internal confusion and turmoil. She paid and started walking to her car. “You left your bag,” the man behind the shop counter called after her. The street in front of the red brick school building was clogged with children. She spotted Sharon on the steps engrossed in a conversation with two other children, tapping her bag against her bare legs. It was so wonderful to see her happy, mingling freely with other children. She had had some difficult periods. For one thing she did not speak at all until she was two-and-a-half years old. Every doctor Mahnaz had taken her to had said things like, “That happens sometimes to bilingual children. They start slower. We’ve given her all the tests we can. There’s no physiological basis for it and she shows no alarming symptoms. She’ll talk eventually.” Then at the age of two and seven months she had suddenly started to speak in full sentences. Sharon rubbed her head against her chest and then kissed her on the cheeks. He was quiet, stunned. She studied his face, trying to assess his feelings but it was hard to tell. His blue eyes looked wary, veiled. Sharon came down the stairs. “Will you play a game with me?” she asked her mother. “You didn’t give me a kiss,” Paul said to Sharon. Sharon went over and kissed her father quickly on the cheek and then ran back to her mother. “Soon you’re going to have a baby sister or brother,” Mahnaz said picking her up and putting her on her lap. By telling her that, she realized she was ruling out abortion. “When?” Sharon asked, looking confused. “We don’t know yet. You’ll help me and your Dad to take care of her,” Mahnaz said. Sharon started going up the stairs and then climbing down, jumping noisily from one step onto another. Mahnaz could see anger rising in Paul. “Hickory, dickory, dock, the mouse ran up the clock,” Sharon chanted. “Leave her alone,” Mahnaz said. A lonely fever had come into Sharon’s eyes. Mahnaz went to her and, lifting her up, she held her against her chest. She felt Sharon clinging to her firmly. She suddenly had a vivid horrible vision– the light in the room changed into the distant, menacing one of the past; this house, the well-tended, flower-filled yard around it, vanished and was replaced by that dark house of her childhood. Then Sharon and Paul disappeared also as if into a dream. When she came back to herself, her heart was beating violently. Then she heard Paul saying to Sharon, apologetically, “I’m sorry my little sweet girl.” He took her from her mother’s arms into his. He rocked her back and forth, rhythmically and kissed her on her cheeks. She looks so much like her father, Sharon thought. “You’ll have someone to play with all the time,” Paul said to Sharon. As Mahnaz watched Paul becoming loving with Sharon, the terrible feeling in herself began to pass. Once again, deep inside her, the frightened self lay at peace. “We’d should think of which room should we set up for the baby?” she said to Paul. “If it’s a boy, we could call him Cyrus. If a girl Roxana… What do you think?” he said. Nahid Rachlin attended the Columbia University MFA program on a Doubleday-Columbia Fellowship and then went on to the Stanford University MFA program on a Stegner Fellowship. Her publications include a memoir, PERSIAN GIRLS (Penguin), four novels, JUMPING OVER FIRE (City Lights), FOREIGNER (W.W. Norton), MARRIED TO A STRANGER (E.P.Dutton-City Lights), THE HEART’S DESIRE (City Lights), and a collection of short stories, VEILS (City Lights). One of her stories was adopted by Symphony Space, on Selected Shorts, and was aired on NPR around the country. Other awards and grants she has received include the Bennet Cerf Award, PEN Syndicated Fiction Project Award, and a National Endowment for the Arts grant. For more please visit her website.